It has been so long since I've had a finish of my own to share but it sure feels good to be able to do so now. In April I learned that a friend was expecting her 2nd child but it wasn't until early September when I learned whether it was going to be a little girl or a little boy. Since this isn't Pink I'm betting you can guess. 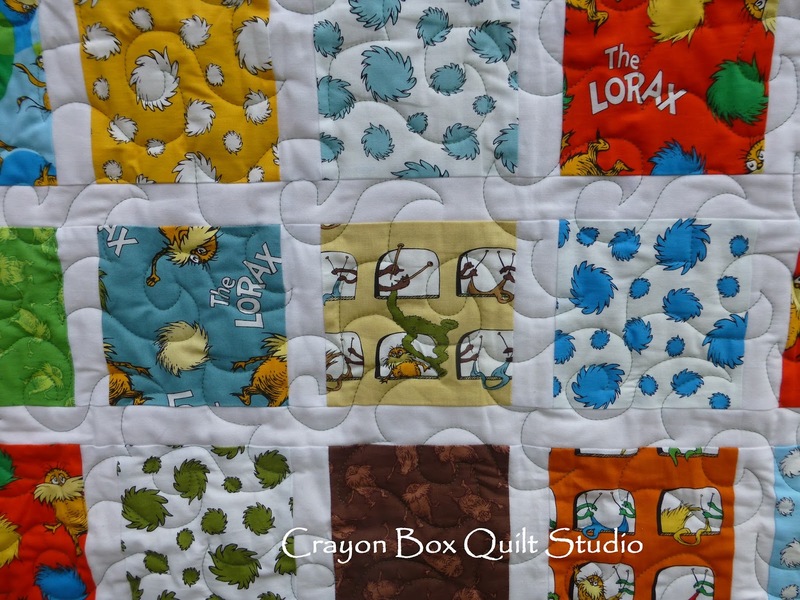 This is the 2nd Where's the Lorax quilt that I've made. Since it is such a cute line and perfect for new babies, when I originally purchased the fabric, I made sure I bought enough for two quilts. I literally duplicated the 1st one that I made a few years ago as I liked how that one turned out so much. There is one big difference though between the two. 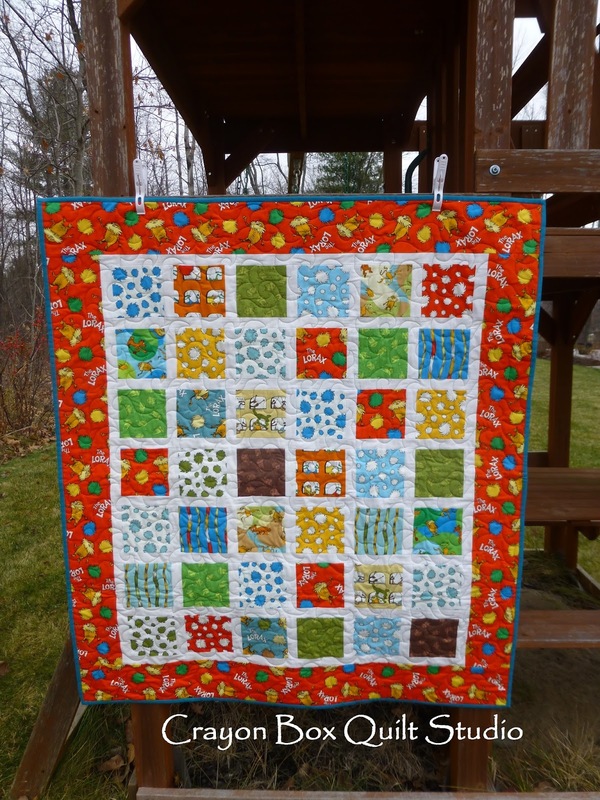 At that time, my Penelope wasn't working so well so the 1st one was quilted with a bunch of straight lines (I can't find the pictures on my hard drive at the moment to show you) but this one I quilted with the Happy Times and I love the way it looks on this quilt. The curves and points of the design mimic the Truffala trees to me. 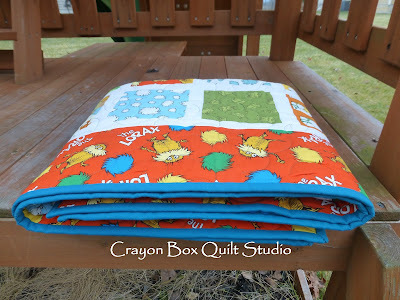 For the backing I used the exact same fabric also. 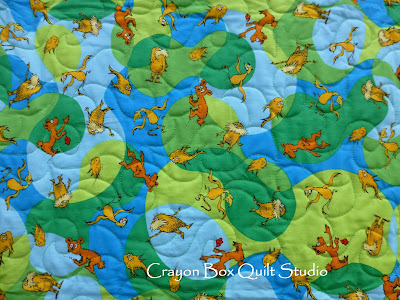 I think this print is great as it has lots of visual interest for babies. For the thread I used a light Sage Green that blended well on the back and only showed every so slightly on the front. After the quick photo shoot I added the label and delivered it to my friend. She was thrilled. 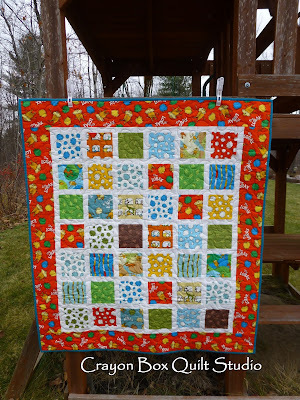 This finish was so satisfying that I'm going to work hard to get more of them done, as soon as my sister Tina's quilt gets off the frame that is. I'm still waiting for the new belt to arrive but the post office tracking says that it will be here today. Along with all of your holiday prep and events, I hope that you get to enjoy a little sewing time. I know that I will. So awesome to see a special project become a finish!!!! Totally adorable! 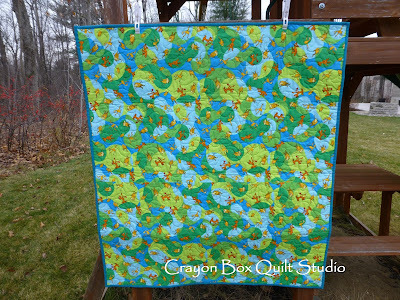 I have quilted a quilt for a client from the same fabric line and thoroughly enjoyed having it "under the needle"!!!! looks great. I remember buying that line too! 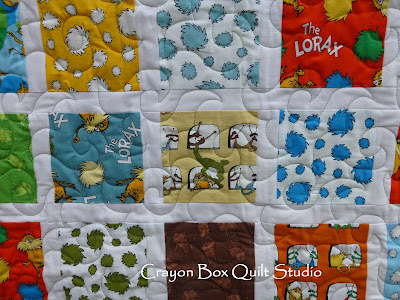 I loved the Lorax fabric line, too - made 3 baby quilts with that. 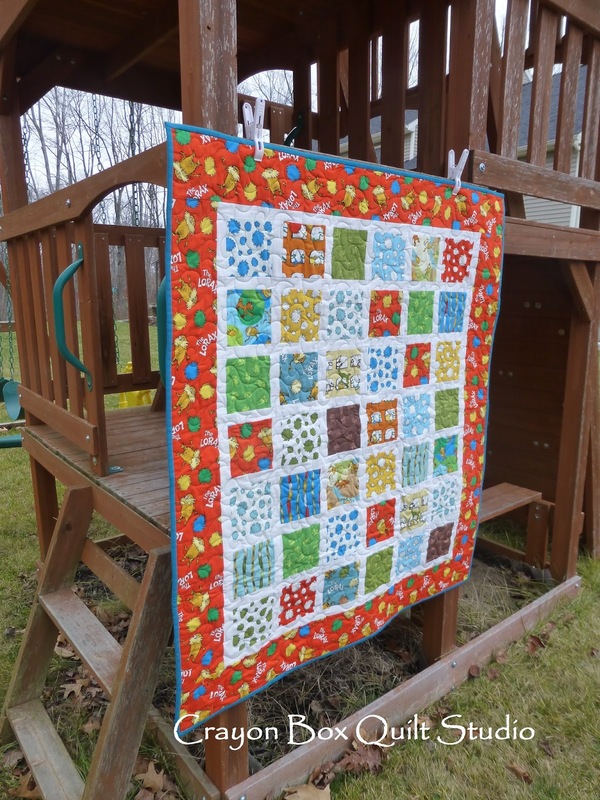 An adorable quilt for a baby. 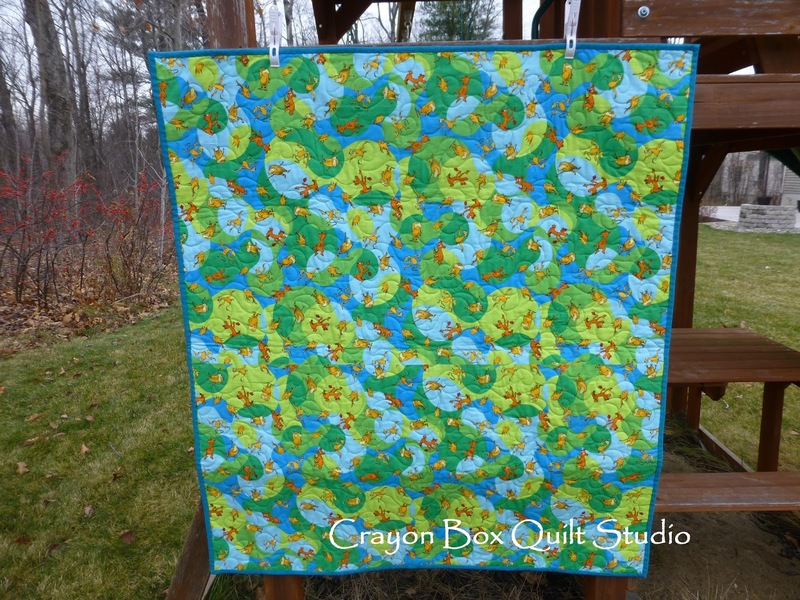 A very cute baby quilt! Hooray for finishes! It's very cute. yES VERY CUTE AND VERY FUN!! qUILTING LOOKS GREAT!